Spring dead spot appears in the lawn as circular areas of dead grass 6 to 12 inches (15 - 30 cm) wide. Spots coalesce to form large areas. 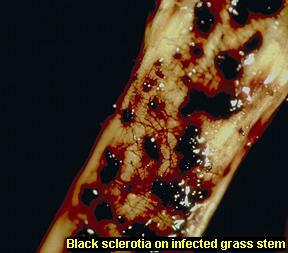 Dark sclerotia are often visible on stolons of affected plants. Sunken lesions can be seen on affected crown buds, roots, and stolons. 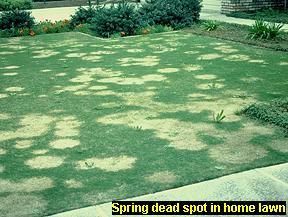 The spring dead spot fungus colonizes dormant plants and grows most rapidly when temperatures are 50° to 57°F. However, damage is usually visible only after the grass emerges from dormancy in the spring and healthy portions start to turn green. A thick thatch layer and low mowing height also contribute to the development of the disease. Spring dead spot survives as sclerotia in the soil and in infected plant parts. Remove dead grass. Fertilize in the summer to maintain vigor but be careful to not overfertilize in late summer. Follow irrigation recommendations for your area and sprinkler output. Dethatch when the thatch layer exceeds 1/2 inch (1.2 cm) thick. Raise your mowing height in late summer or early fall to reduce pre-dormancy stress. Overseeding with ryegrass in the fall may be beneficial. Fungicides are available but generally not needed.